MAGNIFICATION: 179x LOCATION: Kalamazoo Twp. COMMENTS: The primary star (Regulus) is by far the brightest. It has a yellowish color to it. The secondary is faint, but easy to see. COMMENTS: This pair of stars is almost identical in appearance. 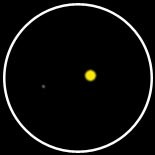 They are very close in magnitude and color (golden-yellow). It almost has a three dimensional quality to it. The primary seems to be the closer of the two. COMMENTS: The primary star is bright and light blue in color. The secondary is noticeably fainter and dark blue in color. This pair also has a three dimensional look to it. The primary again appears to be the closer of the two. 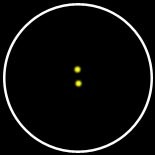 COMMENTS: Two yellow stars of equal magnitude. COMMENTS: The primary outshines the dull secondary star by several magnitudes. The primary is bright white and the fainter companion is dark white or gray. COMMENTS: The bright star in this system is a golden-yellow spectacle. The other star is azure (or blue) in color. Another double star similar to Albireo. How many of these look-a-likes are there? COMMENTS: Two bright white stars of equal magnitude and very close together. COMMENTS: This pair of stars are nearly identical. They are both bright and blue-white. I believe the northern most star is the brightest. They look like "beady blue eyes". COMMENTS: The primary is a brilliant white star. The secondary is also white, but a few magnitudes fainter. COMMENTS: This is the famous double star in the middle of the handle of the Big Dipper. 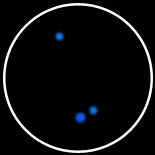 The primary star (Mizar A) is the by far the brightest and is blue-white in color. The secondary (Mizar B) is fainter but of similar color. Alcor, the "nearby" companion, is also blue in color.